Heat oven to 450ºF. Bake pie crust as directed on box for One-Crust Baked Shell, using 10-inch tart pan with removable bottom or 9-inch glass pie plate. Cool completely, about 15 minutes. Reduce oven temperature to 375ºF. 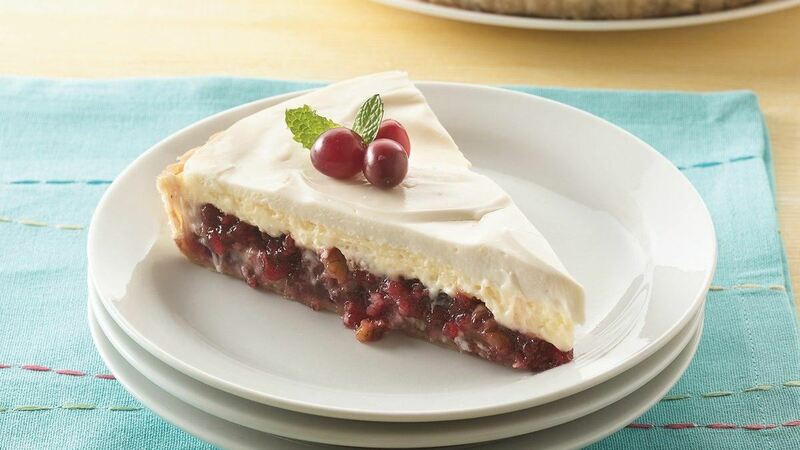 In medium bowl, mix cranberry sauce, pecans, 6 tablespoons sugar and the cornstarch; spread in crust. In medium bowl, beat cream cheese, eggs, 1/2 cup sugar and the milk with electric mixer on medium speed until smooth. Spoon evenly over cranberry mixture. Bake at 375ºF 25 to 30 minutes or until set. In small bowl, mix topping ingredients. Spoon evenly over filling. Bake 5 minutes longer. Cool slightly. Refrigerate 3 to 4 hours or until set. Cover and refrigerate any remaining tart.